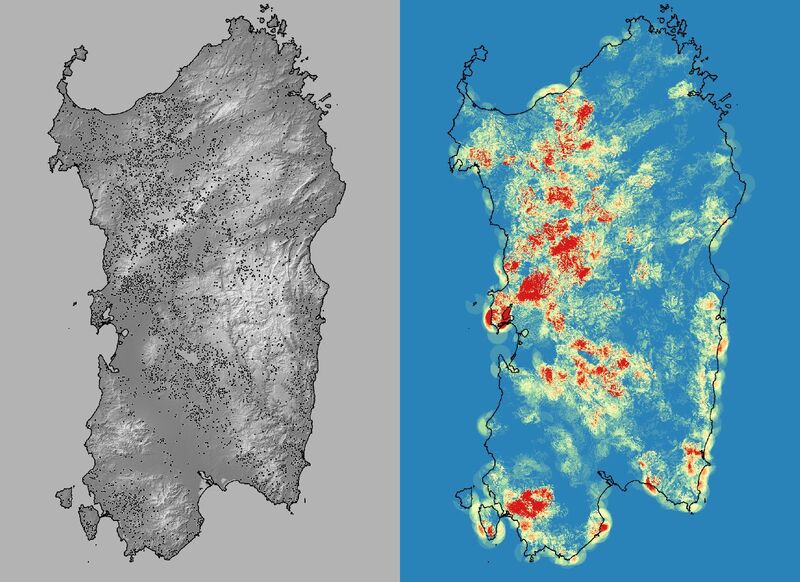 The new viewshed plugin for QGIS 3 features an improved algorithm which should result in perceptible improvements in terms of efficiency. So let’s give it a try! The test data I’m using are the famous nuraghi of Sardinia, drystone towers dating to the 2. millennium BC. These structures, sometimes combining in small settlements, are extremely numerous on the island. There are some 7000 documented sites, which means much more were originally present. Such quantities of archaeological sites are exceptional for European Bronze Age. A list of Sardinan nuraghi is available on nurnet.crs4.it/nurnetgeo, which is great! (Thanks archaeologists!). It is not a scientific database, however, I’m using it for fun. Elevation model used is the EU-DEM with 25 meters resolution.